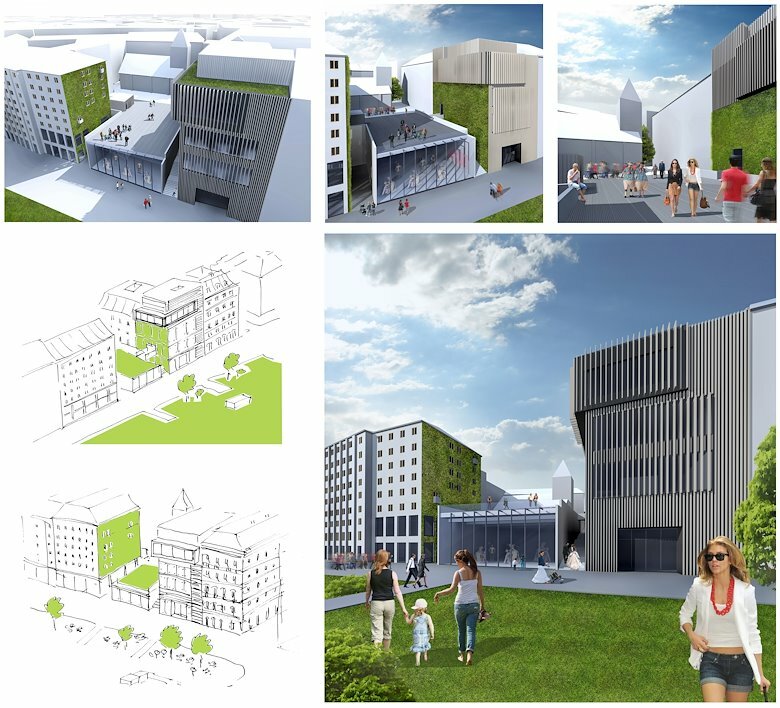 The subject of this master thesis is an architectural design of the public realm: Wien Museum. The idea is to create a building dedicated to collecting and exhibiting art, which will be a separate branch of the leading cultural institution in the capital of Austria. The purpose of this project is to show the possibility of using an unexploited plot located in the centre of the historic part of the city at the Morzin’s Square. The project focuses on the replacement of the existing 9-storey building with a new architectural structure. A further concept is to build the connection between two heritage squares (Ruprecht’s Square and Morzin’s Square) by eliminating the existing 8-meter difference in ground levels. Moreover, the historical ruins are transformed into a basic component of the exhibition space. The museum was designed according to its function. The shape of the object is limited by its surrounding: the roof of the eastern part of the building reaches the top of the berm, so that it becomes an open terrace. The preponderant aspect of the project is to maintain the neutral character of the museum, which is achieved by installing a simple glass façade from the northern part. The exhibition space consists of four exhibition rooms based on the ground floor and underground. In addition to an atelier and exhibition hall, the museum offers a cafeteria, conference room and multi-functional room, sanitary premises and technical facilities. The Vienna Museum’s open staircase and the elevator enable the direct connection between the Ruprecht’s Square and the Morzin’s Square.